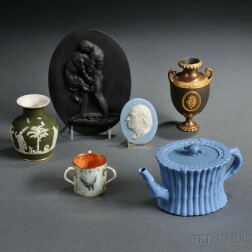 Save your search - find out immediately when "Samuel Johnson" is available at auction! Johnson, Samuel (1709-1784) Facsimile Edition of A Dictionary of the English Language. Decorative Bindings, Sets, Literature, Nineteen Volumes. Decorative Bindings, Sets, Twenty-seven Volumes. 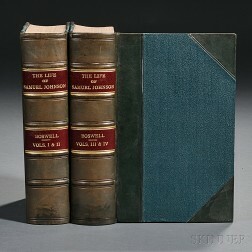 Boswell, James (1740-1795) The Life of Samuel Johnson. Lobo, Jerónymo (1596-1678) A Voyage to Abyssinia. Decorative Bindings, Shakespeare, Fifteen Volumes. Decorative Bindings, Sets, Twenty-five Volumes. Boswell, James (1740-1795) The Life of Samuel Johnson, Extra-illustrated. 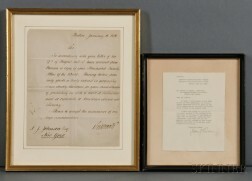 Otto von Bismarck (1815-1898) and John J. Pershing (1860-1948) Letters Signed. Galton, Samuel John (1753-1832) The Natural History of Birds Intended for the Amusement and Instruction of Children.